Our library supports learning throughout the school and provides each class with a weekly time slot to visit. Trained Student Librarians work with our Librarian, Kirsten Puddick, to ensure that the library runs smoothly and meets the needs of the school community. 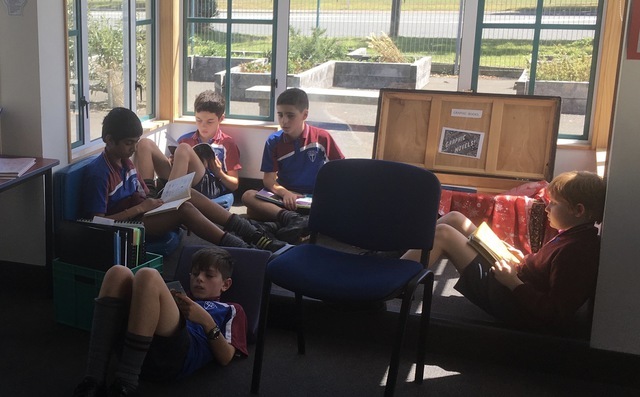 The library is open for book changing, quiet reading and drawing during many break times. search government approved websites through the links provided in the ‘One Search’ option. Without logging in, families and students can still search through our school collection. We welcome donations of high quality books to the library. If you have a resource you wish to donate, please read through our short donations policy to see if it would be suitable. Is it suitable for readers between 5 and 13 years? If it is non-fiction, is the information up to date and relevant (has it been published within the last ten years?)? The Librarian reserves the right to make the final decision as to whether the book is included in the collection or not. Do we already have this item? Is it suitable for our students? Does it have a specific connection to our school or families?